January is almost over and that means Valentine’s Day is almost here! My husband and I have never been big Valentine’s Day people – we usually do something small like make a nice dinner at home. It can be a fun time to gift someone with a simple gift to show your appreciation, whether it’s your mom, significant other or galentine. Skip the expensive flowers and go with something that’ll last all year! All by myselffffff… Today I was able to get out for a couple hours alone! I grabbed a veggie burger for lunch and then ran a couple errands. I’ve been on the hunt for a couple spring items – a dress for Easter and a new spring jacket, in particular. I found a couple options but I didn’t buy them. I’m still considering going back for the first top and jacket! Free People top (I can’t find the exact one online but this is similar) // this top is soooo cute. It’s pretty simple but it’s super soft and comfy. I love the delicate details that Free People puts into their clothes. Nothing is overdone but it always has a great vibe. I could see myself wearing this with jeans or leggings. Free People tunic dress // I loved this! I actually got it in a different color that seemed a bit more ‘springy’ to me. You’ll be seeing it in an upcoming outfit post. Jack by BB Dakota jacket // I feel like this jacket is way more flattering in person than in a photo, but honestly, the photo is what stopped me from buying this! I love the neutral colors and how soft the jacket is. It would be so easy to throw on when heading out for playdates or errands with the kids. I may be going back for it! My mom was actually the one that had the idea to invest in a UV gel light nail dryer and the shellac supplies. We both love getting shellac manicures and pedicures because they last SO much longer, but it’s always hard to find the time to go to the salon. This system does require about a $100 investment, but you easily recoup that after a few manicures and pedicures. 1} Pretend you’re at the salon! Pour yourself a glass of wine, or make yourself a coffee! This iced latte is brought to you by our lovely Jura espresso machine. Ice, vanilla almond milk and espresso layered in a cup and complete with a straw. My favorite! 2} Get your supplies together. I use rubbing alcohol, the Thermal Spa nail drying system and CND Shellac brand base, top and color coats. I usually set up my station at our kitchen bar, so I have plenty of space and it’s easy to see what I’m doing. 3} Clean your fingernails with rubbing alcohol. 4} Put your base coat on one hand. I set this for 30 seconds in the dryer. 5} Put on your first layer of color coat. I set this for two 60 minute sessions. 6} Repeat step 4 for your second layer. 7} Put on your top coat. Set for 60 seconds in the dryer. 8} Wipe fingernails down with alcohol again to remove the stickiness. Truth: I’ve never been that good about washing my face every night. For the past few years, I’ve been using these Simple cleansing wipes. And while I only have good things to say about them, I don’t think they were taking off all my make-up and cleaning my face the way it should be cleaned. I’ve been adding a few new products to my beauty routine, and I LOVE them. Yes, it takes a little more work at the end of the day to get my face “taken off,” but I feel SO much better, and my face is smooth and moisturized. I also have extra sensitive skin, so I’m happy to say these work well without irritating my face. 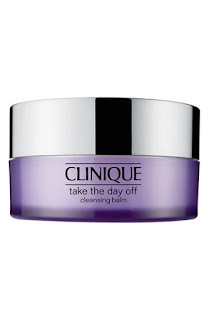 I start with Clinique’s ‘take the day off’ cleansing balm. I love this balm because it reminds me of coconut oil – solid when you first take it out and then it melts onto your hands and face. I massage the oil all over my face, and then wash off with warm water. When water hits, it gets sudsy and you can see the color change with your foundation coming off. It makes my face feel soft and smooth. 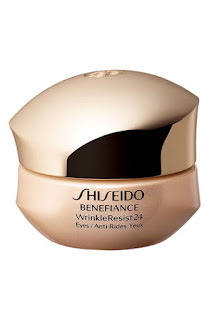 Next, I use Shiseido ‘Benefiance WrinkleResist24’ Intensive Eye Cream. Yes, it’s pretty expensive, and yes, I did debate whether or not to take the plunge for quite a few days. I’m so glad I did though! I’ve definitely noticed a difference in the way my under eyes look and I’m so impressed! You have to use such little of the product, a little goes a long way. I end with a newer product that I was recently introduced to, Tula Hydrating Day & Night Cream. I haven’t tried all of their products, but I love this one! It is SO moisturizing and feels so good on your face. I swear, it does feel like yogurt… in a good way! The cream has probiotics in it to nourish your skin. Sign up for their e-mails to save 15% on your first purchase! Do you have any products you love? I have really been getting into trying new beauty/make-up products!